Collectively, the essays brought together in this book represent a discursive confluence on Nollywood as a local film culture with a global character, aspiration and reach. The governing concern of the book is that texts, including film texts, are animated by a particular sociology and anthropology which gives them concrete existence and meaning. 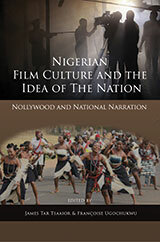 The book argues that Nollywood, the Nigerian video film text, is deeply rooted in the sub-soil of its social and cultural milieux. Nollywood is therefore, engaged in the relentless negotiation and re-negotiation of the everyday lives of the people against the backdrop of their cultural traditions, social contradictions and the politics of their ethnic/national identity, longing and belonging. The essays weave an intricate and delicate argument about the critical role of Nollywood to the idea of nationhood and the logic of its narration with implications for language, politics and culture in Africa. The book is a valuable addition to the critical discourse on the important place of film and cinema studies in national engineering processes. James Tar Tsaaior is a Professor in the School of Media and Communication, Pan-Atlantic University, Lagos, Nigeria where he teaches cultural communication, media/film studies, creative writing and postcolonial literatures. He is also the Director, Academic Planning of the University and editor, Journal of Cultural and Media Studies. Between 2010 – 2011, he was a Leverhulme Trust and Isaac Newton Visiting Research Fellow, Centre of African Studies, University of Cambridge, UK. He was also a visiting scholar, Centre for African American Studies, Princeton University in 2014 and Barnard College, Columbia University in 2015. Françoise Ugochukwu, a Senior Research Fellow, IFRA, Ibadan, and a retired Professor from the University of Nigeria, Nsukka, is currently affiliated to the Open University (UK) and an external collaborator to the French National Centre for Scientific Research (CNRS)-LLACAN, with special interest in Nigerian (Igbo), Nollywood and Intercultural Studies. She is the author of the first Igbo-French dictionary, of several books including one on Nollywood (2013) and two on the Biafran war, and more than 155 book chapters and articles in journals worldwide. Her qualifications, professional career path and area of expertise have placed her at the crossroads between language studies, literature, anthropology, cinema and translation, as evidenced by her publications, PhD supervisions and external examinerships. Her pioneering work in the field and her longstanding contribution to the strengthening of cultural and educational ties between France and Nigeria awarded her the French national distinction of Chevalier des Palmes Académiques in 1994.